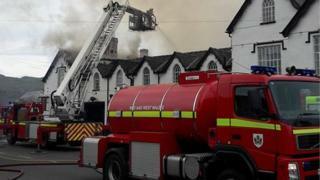 An investigation into a large blaze at a Powys hotel is under way. Five crews were called to the Severn Arms Hotel in Penybont, near Llandrindod Wells at 15:30 BST on Monday after the fire broke out, closing the A44 road. It was put out by 04:15 on Tuesday but crews are still at the Grade II-listed Elizabethan building damping down. Mid and West Wales Fire and Rescue Service praised firefighters for containing the blaze. Area manager Simon Jenkins described it as "a well-established fire" that was "quickly spreading". Five pumps, a water bowser and aerial ladder platform were used as the blaze was put out before it reached the accommodation area of the hotel. Group manager Neil Evans praised the effort of firefighters, many of whom are volunteers who left work to attend the incident. The owners of the Severn Arms posted on social media they were "very upset" by the blaze, but planned to get the pub back open as soon as they could.